In this tutorial I am going to show you how to draw a lily. 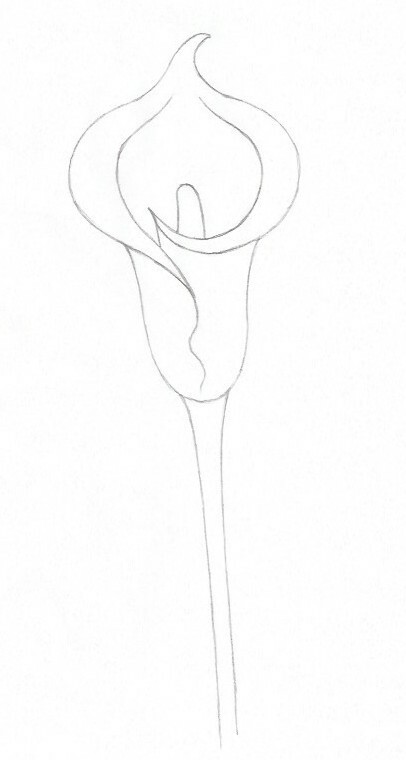 A calla lily to be more specific. This beautiful flower is a favourite of so many people. With its long, slender stems, beautiful look and sturdy nature, it’s easy to see why. For the beginning of this drawing, I am going to take the systematic approach, of breaking it down to the most basic shapes, and building it up from there. This approach is used by so many people from professional designers, to illustrators to hobby creatives, for its usefulness in making the simplest or most complex drawing easily accessible. I highly recommend getting familiar with this way of drawing, as it will allow anybody a vast amount of freedom in what to draw, since anything can be broken down to simple geometric shapes, and then built up from there. How much you then ornate your drawing, and the level of detail you apply is completely optional. This means you can literally draw anything! You start from there, and then you add as much detail as you want, and are able to. And this approach can be applied to ANYTHING! 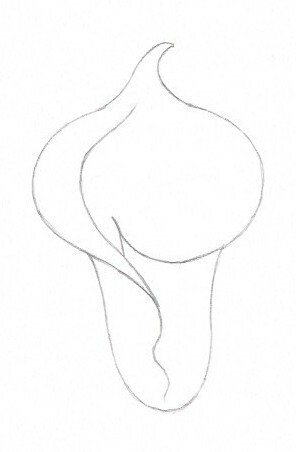 The challenge is to identify the simple organic shapes, and that basically comes down to observational skills. I’ll be diving into this, in much greater depth at a later point, but for now just be aware of the idea. Now, Let’s Explore How to Draw a Lily, Shall We? 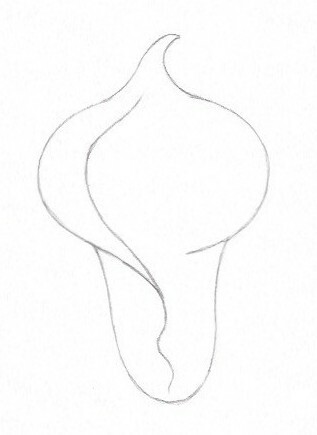 Here’s your first basic shape. Remember to draw lightly, as you’ll be erasing part of it later. Add a prolonged, curving shape to the bottom of it. 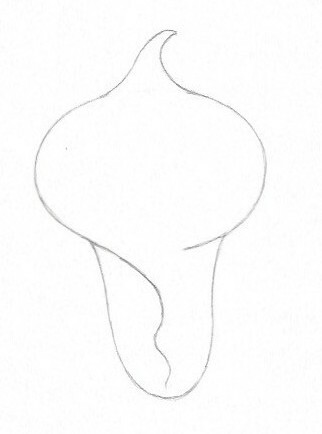 Another very basic shape. From the point where the two shapes meet, draw a line down towards the bottom. 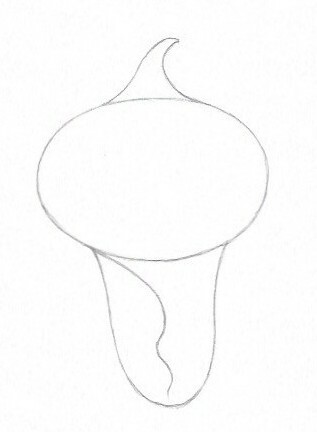 Give it some curves along the way, and try to make it emerge as a continuation of the curve from the original oval. -See how the overall shape of the flower is starting to emerge? 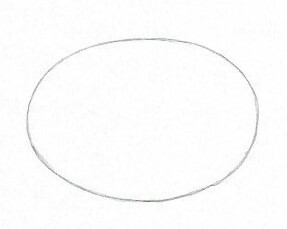 Get out your eraser, and carefully open up the oval on the bottom, and the top. 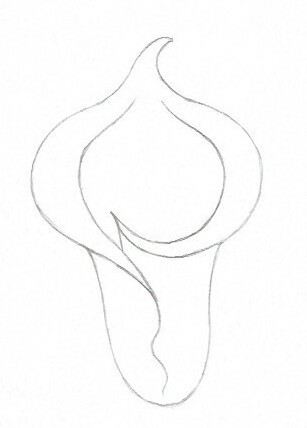 Now draw the left inside of the flower with a line emerging from the curvy line in the middle. 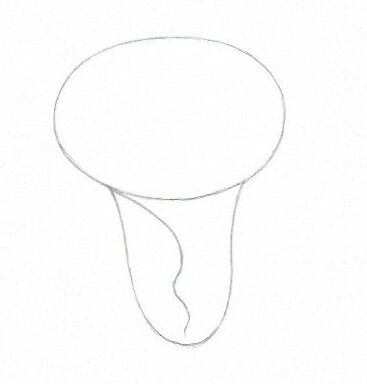 Turn to the right side of where you erased part of the original oval shape, and continue that broken line. Continue the shape upwards, making a point, and then connect it to the left side of the flower. 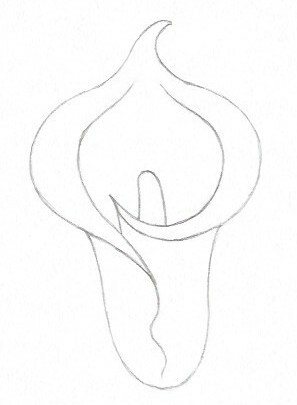 From the pointy shape you just made, draw a curvy line on the inside of the flower. Now draw in the spadix (yes, that is what it is called 😉 ) emerging from the middle. This is your basic flower. 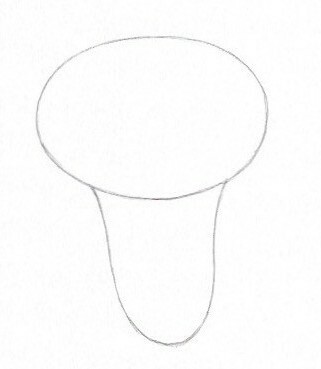 Draw the stem at the bottom. Two parallel lines, with a slight curve at the top, where they meet the flower. We’re gonna add a couple of leaves to the stem. Starting with the outline. Again I am starting with a very basic shape, that doesn’t look like much. There’s no depth, no detail, no life in it. All that comes after. This is what the leaves look like after I have cleaned it up with an eraser. For accuracy, a mechanical retractable eraser or an eraser pencil works well. Now draw a line moving up through the middle of the two leaves, following the basic shape of the leaves. Also erase a small piece of the stem at the very bottom of the individual leaves. This gives the impression of the leaves wrapping around the stem of the flower. Now draw more lines on the inside of the leaves. Have them follow the first line. It might be a good idea to thicken the middle line a little bit, like I have done here. It will help to keep the lines “in order” so to speak. Now you have the outline of your flower. At this point, it’s a good idea to go over all the lines and clean them up a little bit, thickening the ones that need it. 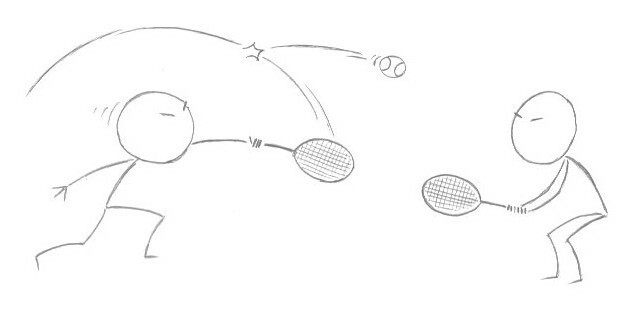 This tightens up the drawing, and gives it a nice consistent feel. Shading is always something that lifts a drawing quite a bit. Here I have begun with something that Mark Kistler aptly calls “nook and cranny shading”. This basically involves a fairly massive shading wherever one shape meets another. I find that this works really well, especially when the additional shading is applied afterwards. I like to use crosshatching. There are, of course, so many different ways to go about it. This is just one approach. It’s a simple one that works well, though. 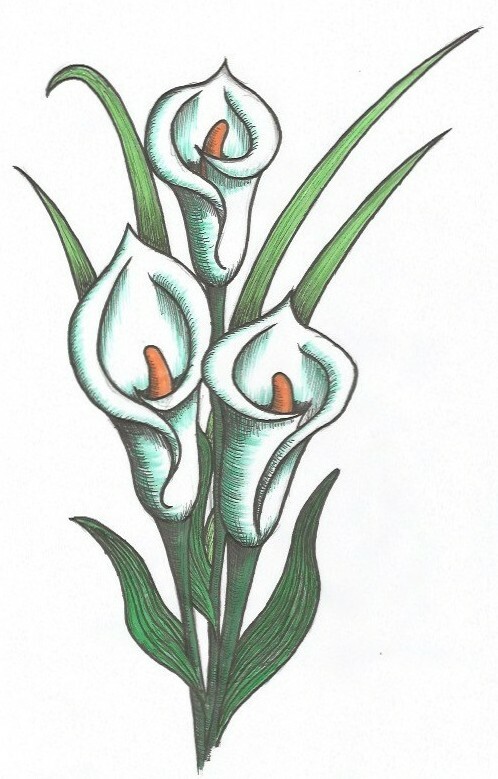 So now that you’ve learned how to draw a lily -a single flower- why not try to expand upon it a bit, and make it into a bouquet. Use my drawing beneath for inspiration, if you wish. As you can see, I’ve added a few long slender leaves in the background for effect. These are simple and work well, but of course completely optional. As you can clearly see, my coloring is not particularly developed. But I would absolutely encourage you to start experimenting with it. Simple markers will take you a long way. As I develop my own coloring skills, I’ll absolutely be adding more content about this. 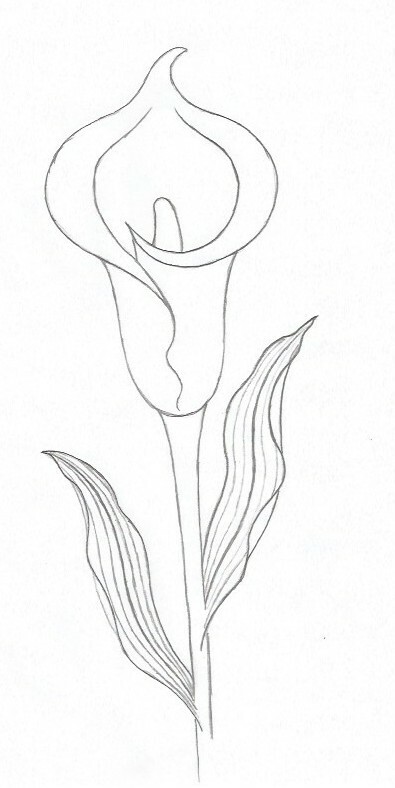 How to draw a lily… There it is! I hope you liked my tutorial! Please leave me a comment. Was it understandable? Did the explanations make sense? Did I explain too much? Anything you can think of, I’d love to hear it. I’m always trying to get better! Until next time, happy drawing! Oh wow! I am a designer, yet my sketching skills are not that good. I love how simple your method is, looking forward to more ideas and techniques, it’s on my 2019 to-do-list: Learn to sketch! I can definitely see how learning to sketch would be very useful for a designer. I’ll be adding a lot more lessons and tutorials, so check back soon! I’m sure you can find something useful. I also link to other great free resources for anyone wanting to learn how to draw. Wow, very Cool. I love your site. I’ve always wanted to learn to draw, maybe something I can try with my kids following your instructions! OMG this is so beautiful! I loved it!!!!! I’m going to print this article for my mum. I’m trying to keep her busy and she will like this challenge. I’m going to share this article too on my Facebook. We need to share more things like this, creative and positive. Absolutely love it. Have you tried those drawing tablets? I was curious about them to paint but not sure yet. Thank you SO MUCH for the kind words! And the fact that you’ll share this with your mom and on your FB… That’s absolutely fantastic! I really appreciate it. I don’t have much experience with tablets. I have tried drawing on a regular iPad, and in my experience it had it’s pro’s and con’s… Some of the pro’s being that you have a plethora of options as far as pencils, pens, colors etc. and you can add and remove as much as you like without it ruining the paper, as with regular drawing by hand. So it really gives you good possibilities for experimenting. BUT… Very importantly! Everywhere I read about manual versus digital drawing, the people who are knowledgeable in those areas pretty much all say the same thing: you should learn to draw by hand first! And then move to the digital media. Thanks again for the kind words, for the visit and for the comment! I have always wished I could draw better, this tutorial makes it so much easier for those of us who are new to drawing or not very good at it. I am excited to try drawing a lily now. Thank you so much for sharing!